In August 1968, I was getting ready to serve as a proselyting missionary for the Mormon church at age 19. I lived in Salt Lake City and was to spend 3 months in the Language Training Mission, in Provo UT on the BYU Campus. I was going to working as a missionary in Sao Paulo, Brasil. I’ve forgotten the details now, 50 years later, but my group of 20 or so was first assigned to be in a training center that had been a dormitory for BYU. Then, after a certain point, some of had to go to stay in “The Rambler Motel” not far for the original location because our dorm was overcrowded. 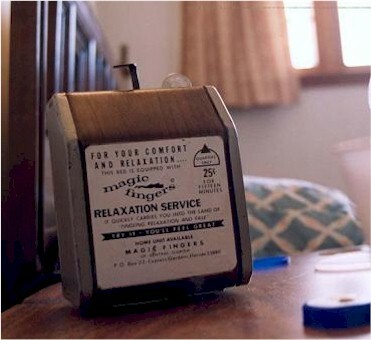 Long story short, the beds in this motel had “Magic Fingers” on every bed and we were explicitly told not to use them at night. Guess what? We did anyway. I think the novelty wore off after a few uses of it, at 25cents per use. Never saw them again in any motel. Great fun to remember but actually somewhat nauseating to experience. In Oct. 1960, my family and I moved from Boston, to the Los Angeles/San Fernando Valley area, in which we drove. It seemed every motel we stayed at had this monstrocity. But, being a kid, 6 years old, I had to try everyone of them. That was also our first drive on Route 66. Since then, and up until 1970ish, every other year we made the road trip back to Boston. I loved those trips, back and forth. Burma Shave, truck stops, Stuckey's and of course returning to some of the same motels along the way. My family went on lots of summer road trips when I was a kid, and we stayed in lots of motels. Many of them had these devices, and my sister and I had to try each one. I recall wondering whether anyone had such things at home (without the quarter slot, of course). Why only in motels?